Today has turned out to be a comfort food day. Not because I’m feeling sad or depressed but because of this fickle weather. I awoke to a chilly fall morning where the sun shone brightly. As the day progressed, the clouds rolled in and not long ago we were treated to a thunderstorm with a hearty downpouring rain. Hence, the need for mac and cheese (homemade with bread crumbs – no out of the box for me!). Plus, it had the added bonus of warming up the house. No way am I turning the furnace on yet! Although, I may cave tonight and put my electric blanket on the bed. The weekend has once again flown by! Although, yesterday was a lot of fun. I give Nicole props for the creative bridal shower/ bachelorette party. She chose to have a cookout and camping, which unfortunately had to be cancelled due to the threat of rain. 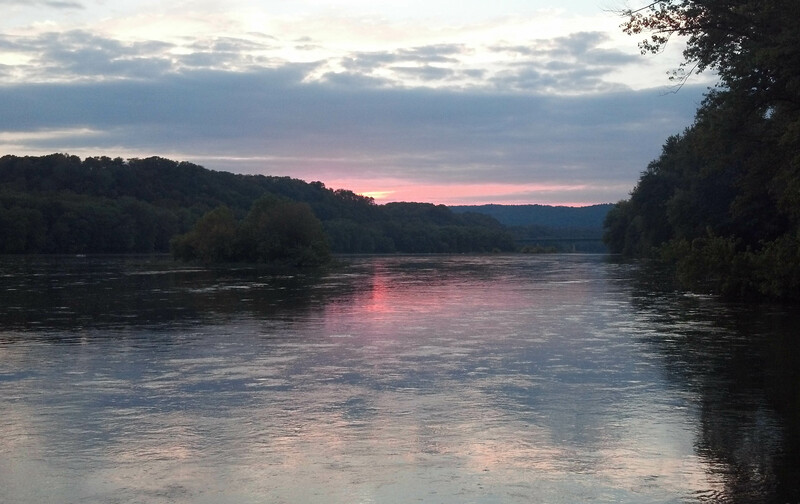 The campsite was right on the Potomac River. I was very jealous! We had no sooner finished our dinner than a group of kayakers arrived for a moonlight kayak tour. Darn it! I would have liked to have gone. Hind sight being what it is I would have gone earlier and taken my bike. The campground is located right along the C&O Canal. I’m sharing a photo of last night’s sunset. Now that fall is upon us, may we all take time to enjoy the little things – colorful sunsets, changing leaves, crisp temperatures, and the aroma of apple crisp . . . just to name a few. God bless!